Bahrain-based Gulf Petrochemical Industries Company (GPIC) has revealed that it exceeded all its production targets for 2017, including the highest daily production of urea (2,055 metric tonnes). The company also set a new monthly production record for methanol (62,300 metric tonnes). This resulted in the total production of urea, ammonia and methanol reaching 1,604,725 metric tonnes, an increase of 1.4 per cent over the previous year, said a statement. A total of 1,204,486 metric tonnes of the company’s products were shipped on board 71 vessels throughout the year and these fetched the best prices from world markets, it said. The announcements were made by GPIC’s board of directors during its recent annual general meeting held at the Ritz-Carlton Bahrain. 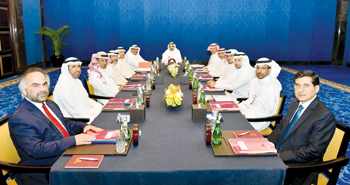 Bahrain’s Minister of Oil, Shaikh Mohammed bin Khalifa Al Khalifa, representing the Bahrain side, presided over the meeting. The Kuwaiti side was represented by Petrochemical Industries Company’s finance manager Talal Issa Al Sultan; while the Saudi side was represented by Sabic director, venture management and joint ventures affairs, Ahmed Bin Saleh Al Duraian. GPIC board of directors chairman Ahmed Al Sharyan said the company continued its achievements in the last year with the combined efforts of all, which resulted in reduced spending and increased production, in spite of the challenges faced by the petrochemical industry. GPIC president Dr Abdulrahman Jawahery said that the company achieved a new record of more than 27 million hours without a lost time accident, thus maintaining a clean slate since May 2002. He said the Carbon Dioxide Recovery Unit would continue to operate and help GPIC reduce emissions.